With equities breaking new historic highs, volatility melted lower into the weekly close, settling -4.3% @ 13.08, the lowest daily close since the Alibaba cycle top of Sept'19th. 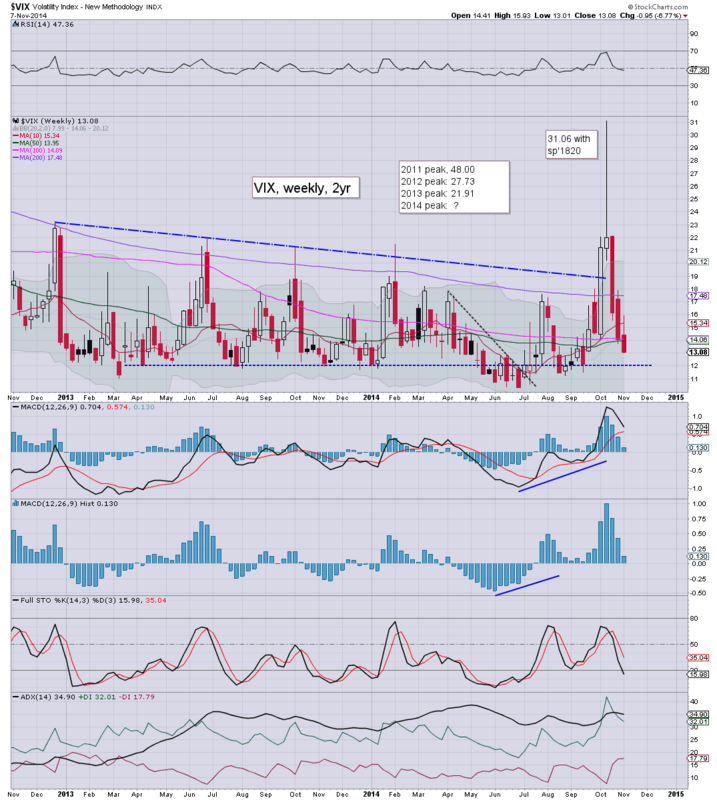 Across the week, the VIX declined by -6.8%, the third consecutive net weekly decline. If equities see a minor retrace to the 50dma - sp'1970s, a move to 18/20 looks just about possible, but the main gap zone of 23-25 is probably out of range for the rest of the year. On no basis - even if the moon explodes, do I expect the recent high of 31.06 to be challenged for some months. It was another day for the equity bulls, with new historic highs in the Dow, Trans, and sp'500 (2034), which settled +0.6pts @ 2031. The two leaders - Trans/R2K, settled u/c and +0.1% respectively. 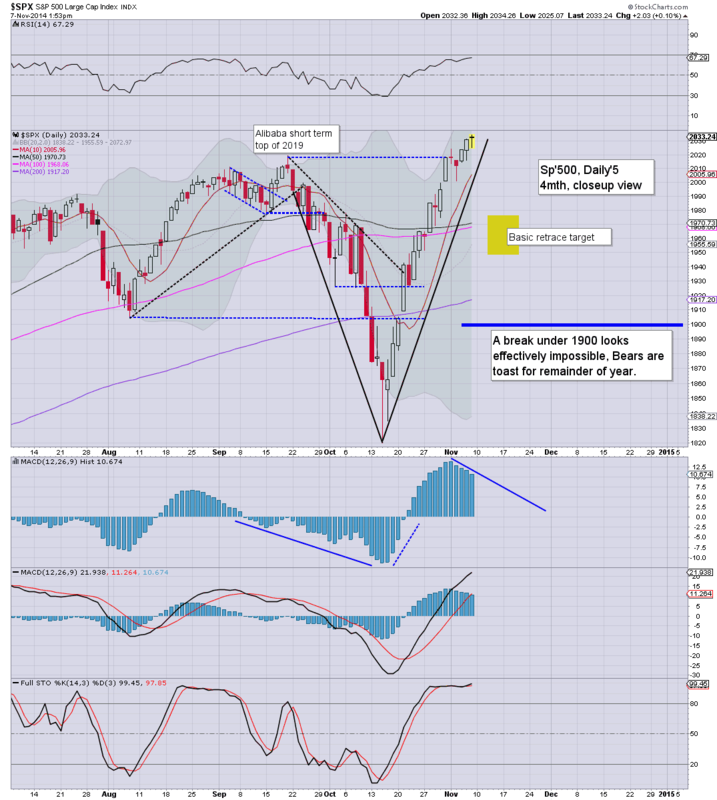 Near term outlook offers (still) a minor retrace to the 50dma in the 1970s. ... and another week comes to a close, with the third consecutive weekly gains. With regular new historic highs, the equity bulls remain in TOTAL control. The fact they have the Japanese now putting in an underlying bid on most world markets is merely a bonus. no positions.... and probably will hit no buttons for remainder of the year. US equities are merely churning into the weekend, with the sp'500 having hyper-ramped 11.7% since the Oct'15th low. Considering the overall sentiment, there seems little threat of sub'1900s for a very considerable time. After all... Bullard will be ready to issue a press release if necessary. *the weak USD, -0.4% is no doubt especially helping the metals (with miners), and Oil, but both of those remain in broader down trends. Its been just another week for the equity bull maniacs. My original hope for a 'sig bounce' to the mid 1900s..now looks laughable. Not only did the market break back over 2000, but it decisively took out the Alibaba high of 2019. 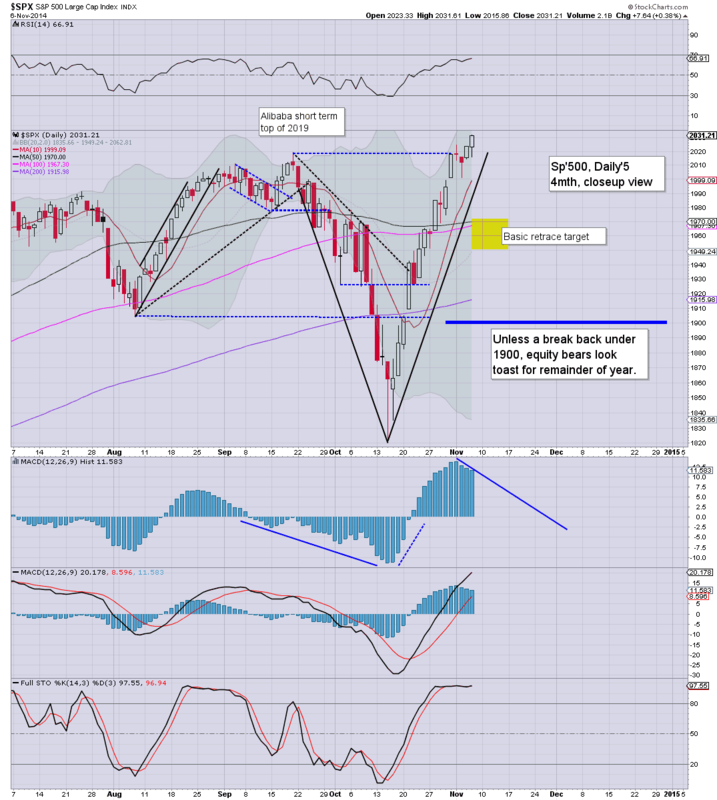 Near term threat of 2040/50... with viable downside to the 1970s. In either case... bulls have little to be concerned of... not least with Santa on the way. I still see a lot of bearish outlooks out there, but with new highs almost every day, how the can hell can some still tout them as valid/intact? 3.20pm.. A few rats are selling into the weekend... but still... net weekly gains... after decisive new historic highs. Hey.. at least now that I'm out.. now the market can fall. Mr Market is more than content with the world. With cheerleaders and analysts blatantly noting that Fed official 'Bullard' will appear as necessary to inspire confidence, there seems little point in any shorts, even for a test of the 50dma.. which is a clear 3% lower. Market price action remains extremely tight... and market is in classic algo-bot melt mode.. as always reflected in the VIX.. cooling -3% in the low 13s. A drop to the 50dma still seems likely this month, but the notion of sub 1900s... seems completely implausible.. even if the moon explodes this weekend. I've been ground down to pieces in equities.. but if there is one thing that has remained on track across the last few years.. its the decline in Gold. Today is almost certainly just another bounce. At best.. a back test of the broken floor, before renewed downside into year end. If correct, that will of course mean the miners will follow. Price action remains classic algo-bot melt mode, perhaps one of the most tiresome phenomena anyone can experience. The real action is in the metals/miners. Metals are battling to bounce hard.. but the old broken floor of Gold $1179 is going to be near impossible to break back over. Similarly, miners will likely get stuck.. and turn lower once metals are exhausted. Broader targets remain unchanged. I am quite aware I am cursed, and it is rarely easy in my world. I have battled through much of 2014 in warrior mode, but it hasn't been enough. Effectively a year of overall failure. What is clear though, sacrifices have to be made on the part of the equity/macro-econ bears, and why not via me? With a real attempt to maximise loss (via the smaller 5/15min cycles), I have duly closed out a remaining index-short at sp'2033. Hopefully, it will be enough of a 'bearish sacrifice' to turn this market lower. 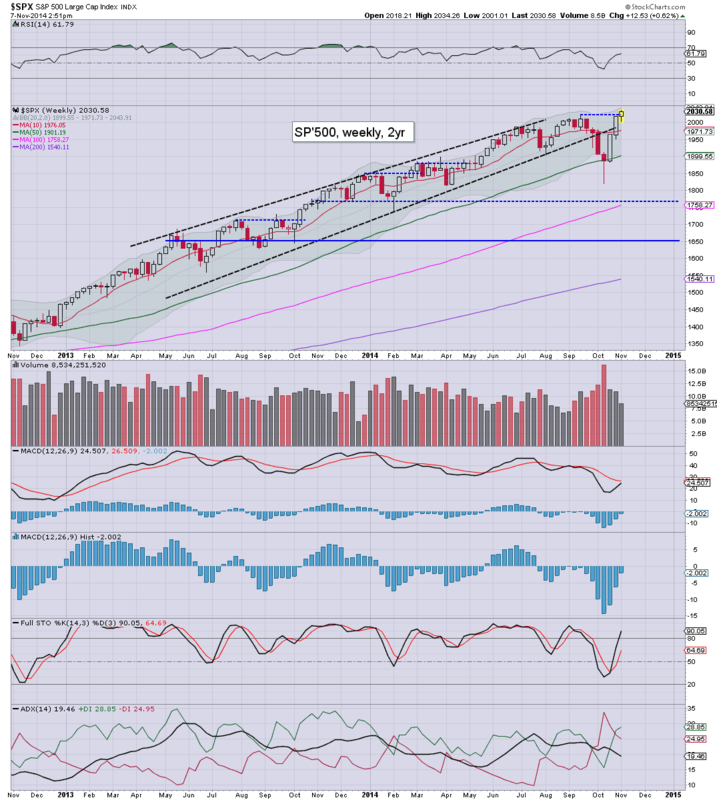 Right now, at best, equity bears might get a hit of the 50dma - the sp'1970s within a week or two. time for a capitulation lunch (which surprisingly, doesn't include cyanide today). Minor chop.. with VIX stuck in the mid 13s. Notable recovery in RIG, +0.2%... which is a strong reversal from opening -8%. Overall though, the news is lousy, and with broadly weak oil prices, the oil/gas drillers look set for much lower levels into spring 2015. US equity indexes break another trio of new historic highs in the Dow, Trans, and sp'500 (2032). There is notable strength in the precious metals, Gold +$20, with Silver 1.6%. 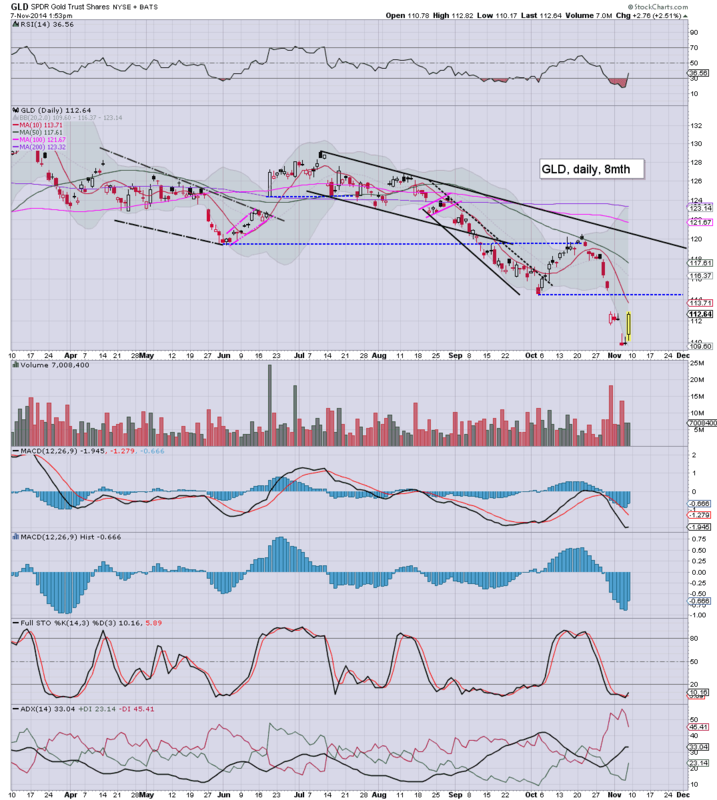 This is helping the miners, GDX +5.8%. New highs in 3 indexes... price action is much like yesterday. We're in algo-bot melt mode. 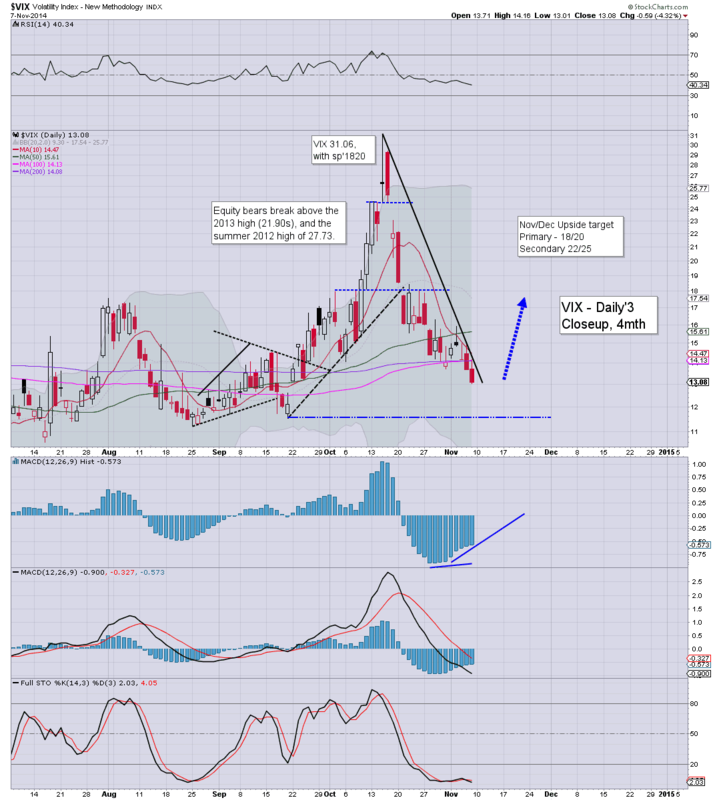 VIX looks floored in the 14/13s.. and is still suggestive of at least a move to the 18/20 zone, but overall, there is ZERO hope of anything significant for the bears. No doubt, the BoJ are buying up the market this morning. After all... what else would they do? 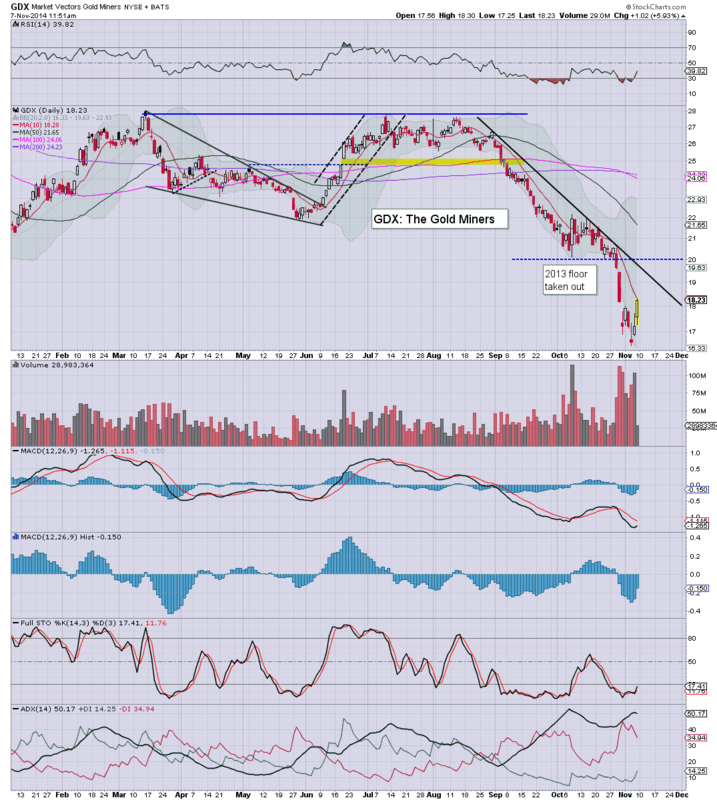 As for the metals.. its merely a bounce. The Gold floor was taken out last week, just how stupid are people to already have forgotton that? Ohh, thats right, they are the gold/silver bugs. *I'm considering closing out an index short at the top of the next up wave. A 'sacrificial bear capitulation' on my part, just might be what is necessary to turn this market around. Best attempt to maximise loss, sp'2033. I can only hope - for the rest of the bears holding out, it is enough of a sacrifice to turn this market lower next week. Futures are a touch higher - ahead of the monthly jobs data, sp +2pts, we're set to open at 2033. Metals are again trying to bounce, Gold +$2, with Silver +0.1%. Oil is building early sig' gains of around 1.0%. 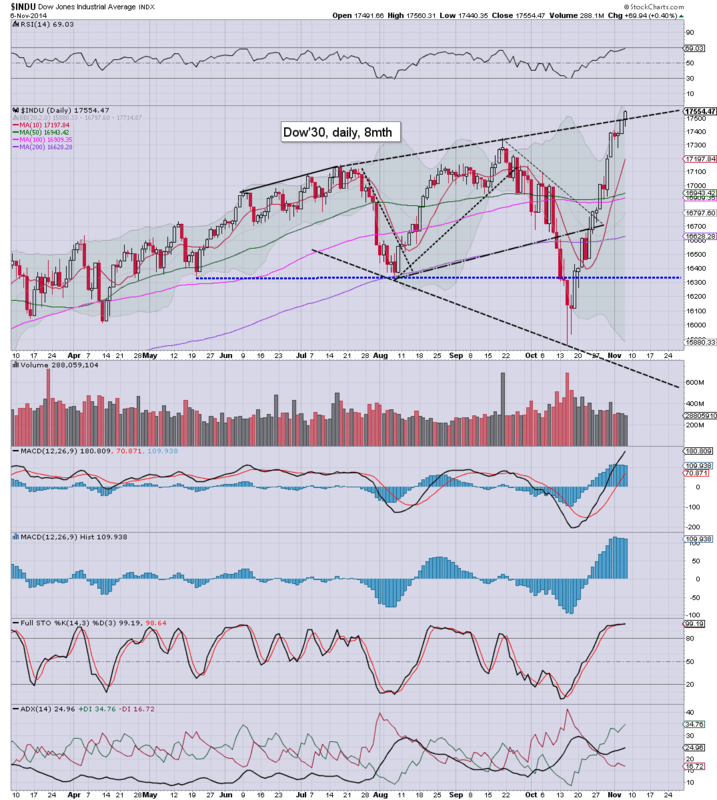 Market is awaiting the jobs data... sp'2040/50 is viable today... not least if we continue in algo-bot melt mode. *I'm tired, a 'bear sacrifice' is probably necessary, and I might close out a semi-dead short-index position at the open. Only then.. might the market be able to fall, once I'm out. Oil/gas drillers: RIG -8% @ $27.50.... Q3 earnings were cancelled... with some $2.5bn or so of write downs. RIG looks headed for sub 20s.. not least if Oil slips to the low $60s by the spring. 8.31am.. Monthly jobs.. 214k... in line.. arguably the 'goldilocks' number. The US dollar continues to strengthen, and broke into the 88s (DXY) today, the highest level since June 2010 - the time of the EU bond rate scare. 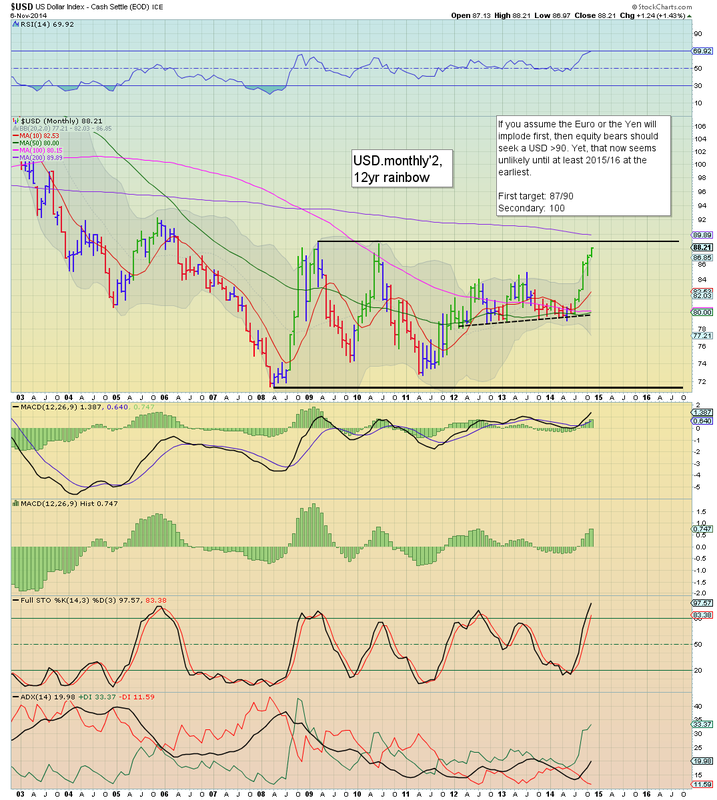 A break >90, would bode for a continued move to 100 in the first half of 2015. The fifth consecutive green candle on the monthly 'rainbow' chart, and we're already in the first target zone of 87-90. We have a massive support floor in the 78/80 zone, and it sure doesn't look like we'll be down at those levels for some considerable time. Indeed, the only issue now is whether we see the 90s before year end, or in Jan/Feb. For the USD bulls, it should make little difference. What is clear, a break into the 90s should mean we'll hit the giant 100 level by summer 2015. A higher USD is bearish for ALL US $ asset classes, and that certainly includes equities. However, the equity bears face the problem that capital flows into the USA are strong, and are likely going to increase. So... we could see a higher USD, but equities still broadly climbing. The most adversely affected aspect will be in commodities, especially the precious metals and Oil. We already have a clear break down in OIl, losing the $90 threshold, and now on track for $65/60 next spring. Similarly, Gold looks on track to test (if briefly) the giant $1000 threshold. So much for the 'dollar doomers'. Perhaps the most notable of the $ doomers is Peter Schiff. I have to say.. and take me especially seriously here.. I have massive respect for the Schiff. He had correctly warned about the property bubble and CDS problem a full year or two before that issue blew up. He tolerated being laughed at, day after day... and was unquestionably proven right. Yet.. Schiff has been completely inflexible when it comes to currencies. 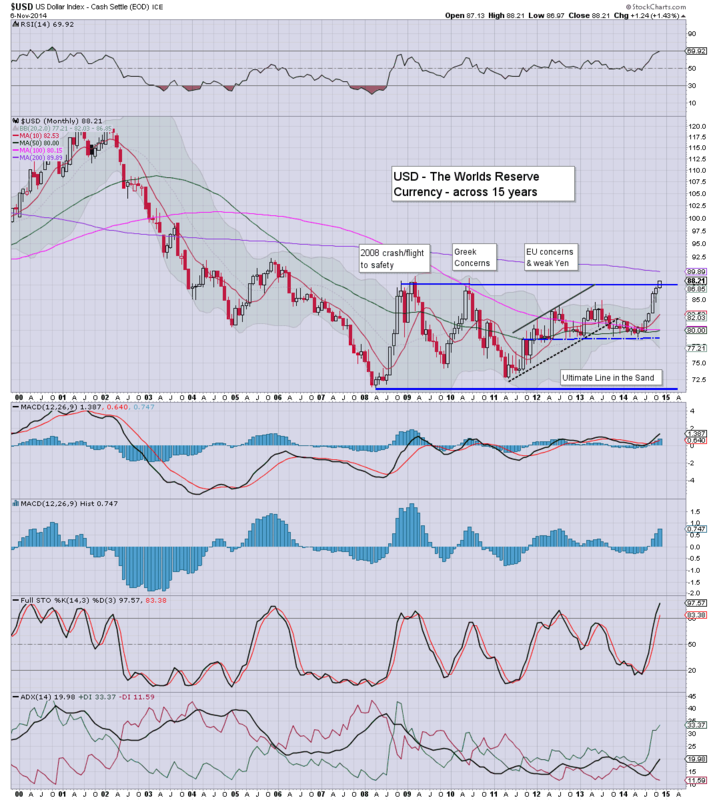 He has continued to call for a dollar collapse, and here we are.. on the threshold of a massive multi-year breakout. I have to wonder, what will Schiff say when the USD is in the 100s next summer? Friday will be largely about the monthly jobs data. Market is expecting net job gains of 240k, with a headline jobless rate of 5.9%. That does not seem overly optimistic, and I'd certainly expect a number at least in the 175-225 zone. There are 3 fed officials on the loose, including the Yellen, who will be in Paris, with an entire pack of banksters. *I should add, all comments are most welcome. It has been a busy few weeks, not least because of the many messages/emails. The US equity market achieved a trio of new historic highs, with the sp' settling +7pts @ 2031. The two leaders - Trans/R2K, settled higher by 1.3% and 0.4% respectively. 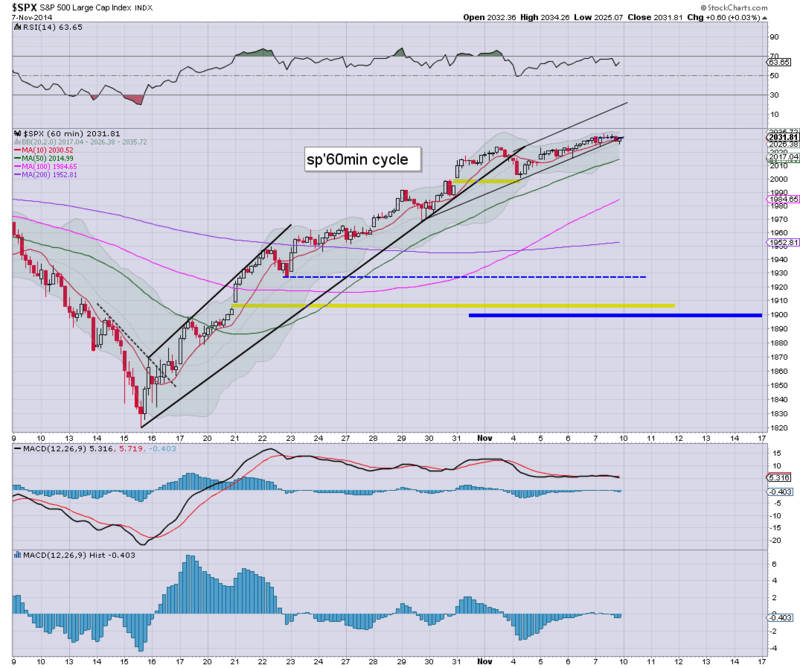 Near term outlook is still offering a rather 'overdue' retrace. The day opened with some mixed chop, but it became somewhat classic 'algo bot melt mode' across the afternoon, with the sp' breaking into the 2030s. Those seeking some kind of giant wedge on the Dow.. well, we've just broken through the upper level.. so... what now? All things considered, a retrace IS still due... but the higher we go, any hope of a move to test the sp'1900 threshold has almost completely faded. More likely, a test of the 50dma, which next week, will be in the low 1970s.